Take stock of what has happened to Kansas tax policy, and then ask the question, “Who benefitted?” Here’s a hint: It wasn’t middle class or low income Kansans. Big changes in Kansas tax policy began in 2012 when Governor Brownback signed sweeping tax cuts into law. Income tax rates were lowered across the board and individuals who receive their income through “business” sources were exempted entirely from paying state income taxes. Yes, in that action, income tax rates went down for everyone, but at the same time, lawmakers also raised the sales tax and took away credits that helped low income Kansans. Even with the offsetting sales tax increase, the income tax cuts proved so costly that they triggered a severe budget crisis. 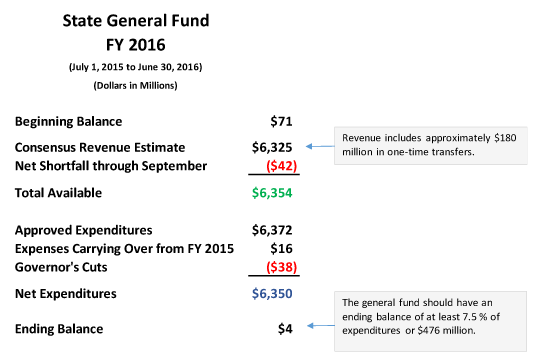 In the first year, general fund revenue dropped $701 million, more than 11 percent, jerking the state budget badly out of balance. Lawmakers covered the ballooning gap between expenses and rapidly falling income by using up all of the state’s financial reserves. With the bank account emptied, lawmakers tried to close the gap by cutting programs, including school funding. And they transferred unimaginably large sums of money from the highway fund and from virtually every other fund in the state treasury that had cash. Despite these irresponsible actions, they fell far short. At that point, even the most conservative lawmakers decided to raise taxes. Sales tax rates rose again. 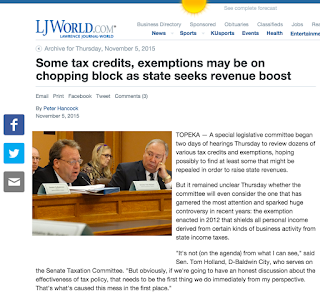 Lawmakers hiked cigarette taxes sharply, and eliminated most income tax deductions. Property taxes continued to go up, largely because school districts tried to survive reductions in state aid. What’s the net result of all those tax changes? For the 20 percent of Kansans who earn the least, below $23,000 a year, average taxes actually went up by $197 a year. For the next 20 percent, net taxes also jumped higher. Middle income Kansans essentially broke even. But the top 20 percent of Kansas earners came out far ahead, and the top 1 percent, those who earn more than $500,000 a year, picked up an average tax break of about $25,000. All these figures come from the Institute for Taxation and Economic Policy, a group that has developed probably the best model for measuring these types of changes in any state. But it doesn’t take a study to tell us what has happened. Any Kansan can see it. A sales tax hike takes a far bigger bite out of a small income than a large one. Lower income Kansans spend a much higher proportion of their resources on food and other items subject to sales tax than wealthy Kansans do. Kansas now has the second highest state sales tax rate on food in the nation. The shift to sales tax has contributed to making our state’s tax system one of the ten most regressive. The poor pay a far higher percentage of their income in taxes than the wealthy, not a statistic of which Kansans can be proud. 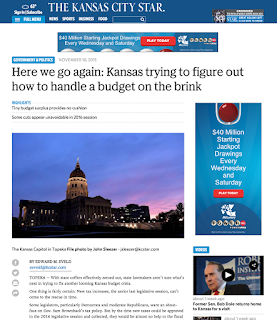 Yet even after shifting the burden of state taxes onto middle class and low income Kansans, the budget is still not working. 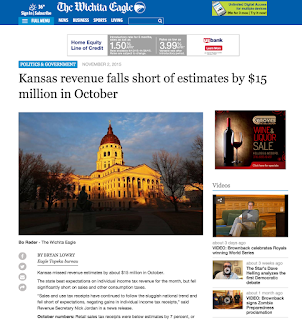 The tax breaks for the wealthiest of Kansans produced such a huge revenue loss that the state budget remains in the red. Just this month, state officials announced yet another downward revision of the future revenue forecast. So more “fixes” are ahead. If the real goal was to shift more resources to the wealthiest Kansans, this policy has worked like gangbusters. But if the goal was to adequately fund state programs with a fair taxation system, it’s a wreck. The state budget is in shambles. Unless we change course, the lowest income Kansans and the Kansas middle class will bear even more of the burden of fixing it.